I’m glad that guy is a ghost and not alive. Otherwise he’d invite me to his birthday parties. And you know they’d be hella lame. P.S. – My friend Clark helped me write this strip. Clark if you’re reading, I owe you some High Life. 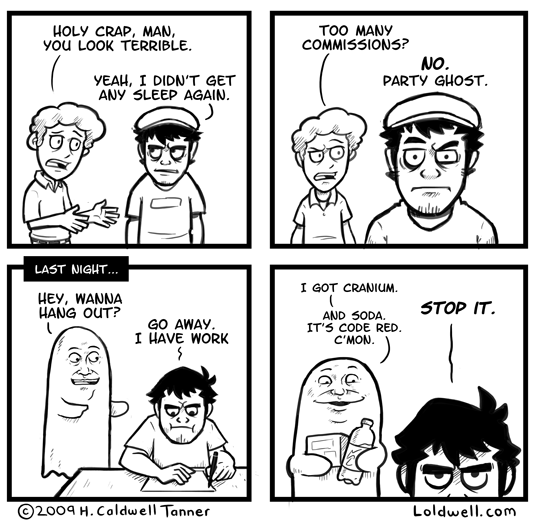 As I mentioned on mah twitters… this is me except replace Party Ghost with my friend Scott and Cranium with Left4Dead2. How come a ghost has more facial features than a human? And how comes you ain't wearing a collar? As I mentioned on MY tweeterz, we've all got a little party ghost in us. I tend to party ghost my friends into watching FLCL with me…even if they've never watched an anime before. 1. Who are you to question the ways of the afterlife? 2. I didn't realize I was still under collar contract, my apologies! It is the source of your power; one collar to rule them all. I will purchase one from Collar Craig. If he can't bind me a collar then I don't know who can. 2. Once you go Chad, you never go back. which Chad are you referring to? Is that the bad anime-influence-guy who's forcing you to wear ridiculous popped collars you were talking about earlier? JUST GIVE ME YOUR HAND! I don't recall that, can you link it? The box is getting tiny. And I stand by that comment. Out of the sudden, your help doesn't seem so impressive if you life is an abusive mess. I meant you should give me “a hand” in dealing with my anime abuse problem. EDIT: Oh boy, I misread anime. I thought it would be animals. That would have een alot more random. And gruesome, too. Next time, weakened eyesight, next time! Goddamn zombies just won't let me SLEEP. Friends who have never watched anime before? lol last time I had one like that I forced her to watch 3 different ones and turned her into a pervert. Does that make me a bad person? You are merely the vinegar to her baking soda. Together you have created a volcano of repressed emotion. So, you're not a bad person, you're a SCIENTIST. It's like this guy that calls me at the most random of times. Is this guy a ghost? That is an important question to ask yourself. And thank you for the kind words! Be sure to check back as I actually plan on making more of these. Yeah, I completely forgot about Party Cat when I did this strip. I felt kinda bad because I LOVE Nedroid. But that's just the way of the internet. We are a hive mind after all. It amuses me how you've captured everyone's creepy uncle in that party ghost face, and also how he enjoys some of the same vices. Can't say no to the red. Party Ghost is cool, just…never get in a situation where you and him are alone together.